Easy File Shredder is an all-in-one data erasing solution for individuals and businesses. It helps to securely shred confidential files, remove all traces of already deleted files, and clean-wipe hard drive space to ensure that no private data can be recovered. Easy File Shredder shreds files beyond recovery. It uses advanced data deletion algorithms approved by the military and government organizations. 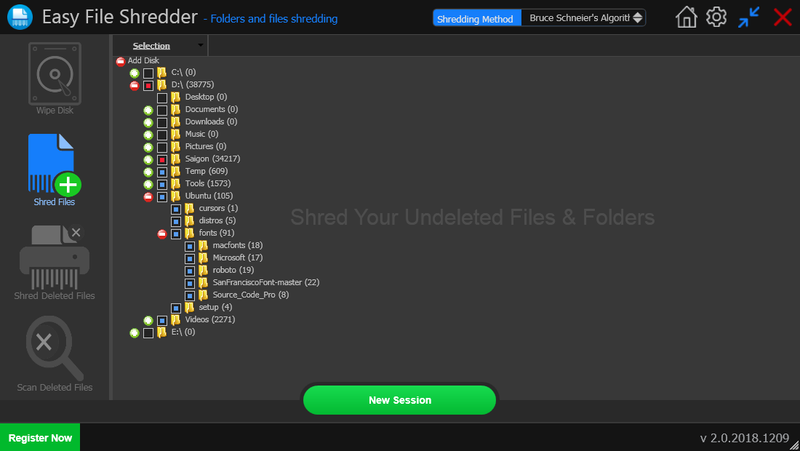 Deleting files with Easy File Shredder means they are gone for good. 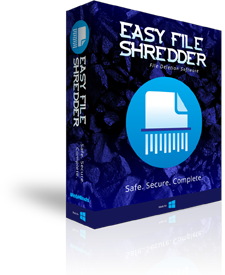 Easy File Shredder can shred already deleted files from hard drive free space. This gets rid of traces of all previously deleted files quickly and securely without affecting any existing files. The program uses DoD 5220.22 and DoD 5220.22-M shredding algorithms, which guarantee maximum security. If you're planning to sell or give away your computer, simply formatting the hard drive isn't enough. There is software that can recover data even after a quick format, which compromises your privacy. Wiping your hard drive with Easy File Shredder will ensure that all data will be gone for good and nobody will be able to recover it using professional file recovery software. Easy File Shredder is very easy to use. Shredding files or free space is an easy three-step process. All you need to do is launch the program, select the files to shred and use one of Easy File Shredder’s algorithms. Bruce Schneier's Algorithm - a data shredding method created by Bruce Schneier, an American cryptographer, computer security professional, privacy specialist and writer. This method overwrites data in 7 passes where the first two passes are zeros and the rest of the passes use random characters. German VSITR - the German standard for erasing data. It uses 7 passes where six passes are zeros and the last pass overwrites data with random characters. ITSG2006 - originally published by Communication Security Establishment Canada (CSEC), this method shreds data in three passes. Peter Gutmann's Algorithm - a shredding method by Peter Gutmann that overwrites data in 35 passes. This method offers high security, but it can take a while to complete. Random algorithm - overwrites data with random characters. Russian GOST P50739-95 - a Russian government-approved shredding method that overwrites data in two passes where the first pass uses zeros and the second pass uses random characters. US Air Force 5020 - overwrites data with three passes where the first pass writes zeros, the second pass writes a one, and the last pass writes random characters and verifies the process. US Army AR380-19 - overwrites data in three passes where the first pass uses a random character, the second pass uses a specified character, and the third pass uses the complement of the specified character and verifies the process. US Department of Defense DOD 5200.28 STD(7) - a high-grade data shredding algorithm that overwrites data in seven passes using a special pattern. US Department of Defense DOD 5220.22 M(3) - overwrites data in three passes using a special pattern. US Department of Defense DOD 5220.22-M (E) - overwrites data in three passes where each pass verifies the process. The first pass uses zeros, the second pass uses ones, and the last pass uses a random character. US Department of Defense DOD 5220.22-M (ECE) - overwrites data in three passes and works very similar to other US Department of Defense algorithms. Zero Algorithm - overwrites data in one pass using zeros.